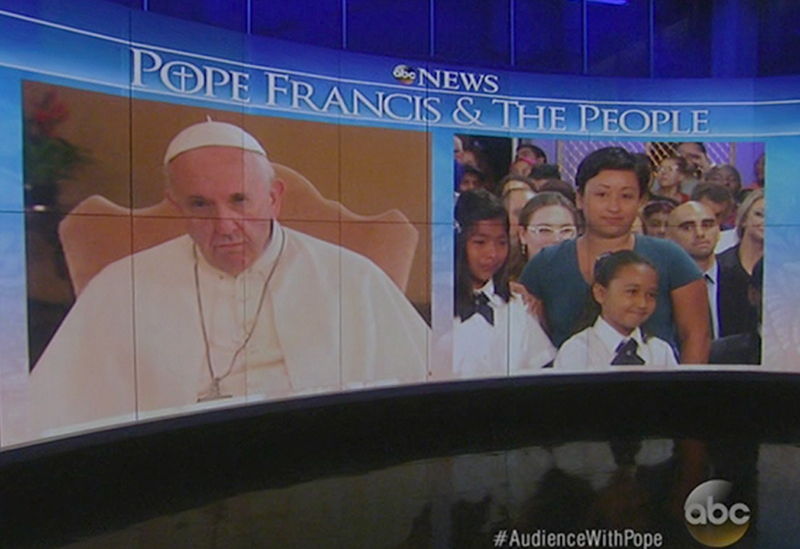 Pope Francis participated via satellite on August 31, 2015. 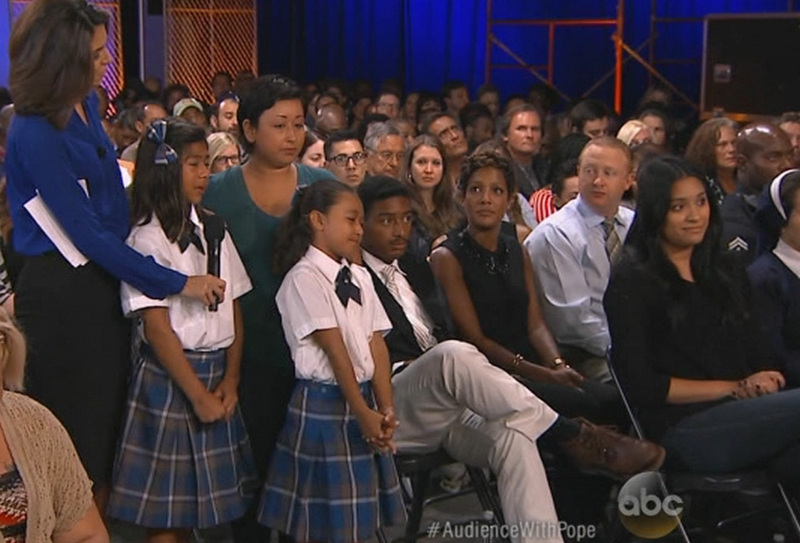 ABC News invited Good Shepherd Center for Homeless Women and Children (GSC), a program of Catholic Charities of Los Angeles, Inc., to participate in a Town Hall-style Meeting on August 31, 2015 to discuss issues related to poverty, immigration and youth. The meeting was held in preparation for Pope Francis’ visit to the United States on September 22, 2015. 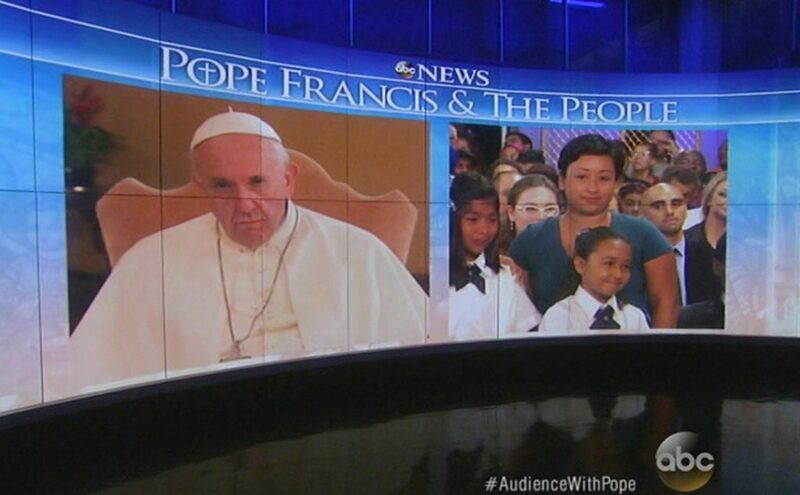 To the surprise of Good Shepherd Center and the other audience members (homeless women and men from the other selected shelters), Pope Francis participated via satellite and answered audience members’ questions from three stations: Los Angeles – Poverty; Texas – Immigrants; and Chicago – Youth. One family who was selected to share their story are former residents of Good Shepherd Center. Rosemary Farfan and her two daughters spoke about their struggles with homelessness and the difficulties of raising two children in a single-parent household. Pope Francis commended Rosemary on her bravery and hard work to raise her two beautiful daughters. This special broadcast aired on Friday, September 4, on ABC Channel 7 at 10:00 p.m. PDT, during the normal broadcast time of 20/20.